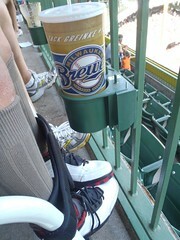 For the July 6, 2011 Dbacks @ Brewers game we sat in the wheelchair row in section 434. 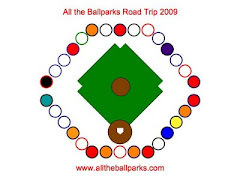 It was much better than where we had sat for the ballpark trip. 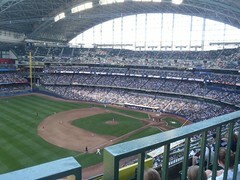 It is in the highest section, but you at least can see the whole field as well as the scoreboard. 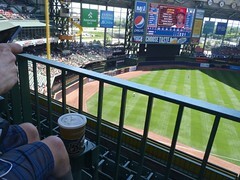 Mik, of course, approves of them as being good seating because they have cup holders. However, they fill the section with folding chairs and there are no ushers around to take them out of the way. Thus with the sold out wheelchair section situation there ended up being quite a few chairs in the way of the walkways to the rest of the section.